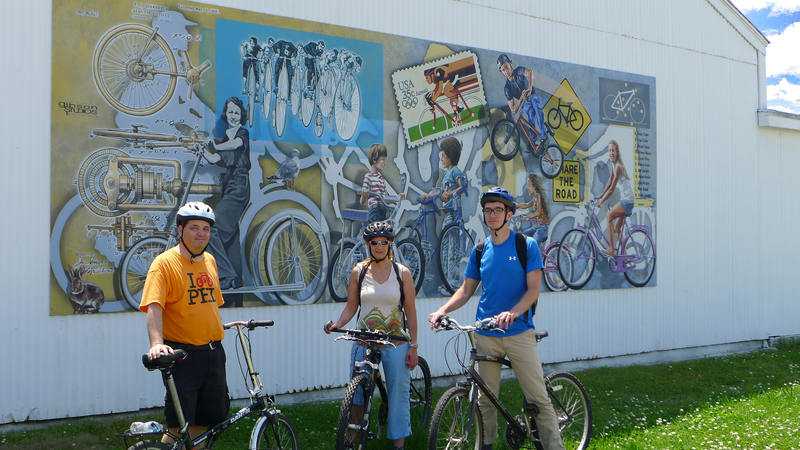 Why should your community become more bicycle and pedestrian friendly? Bicycle and pedestrian friendly communities are happier, healthier, and more livable places. Creating a more welcoming environment for bicycling and walking improves resident’s quality of life and your municipality’s bottom line. Encouraging biking and walking reduces a community’s automobile dependence. This allows residents to become more active, reduces air pollution, and creates an equitable transportation network open to all—regardless of age, physical ability, or income. Bicycle and pedestrian friendly communities benefit economically; encouraging local spending, spurring tourism, creating jobs, and attracting new homebuyers. Thirty minutes of physical activity a day has proven effective in preventing many serious health conditions. Providing a bicycle and pedestrian friendly environment encourages your residents to engage in routine physical activity. Automobile emissions are a leading cause of air pollution. Encouraging people to replace some of their shorter car based trips with walking and biking will reduce harmful emissions and improve your community’s air quality. Bicycling burns calories, not oil. Bicycle and pedestrian friendly communities provide more travel options for people of all ages, including children and the elderly. Biking and walking are affordable for everyone, regardless of income – expanding your entire community’s access to jobs and services. A Rutgers University study found that biking and walking contributed $497 million to New Jersey’s economy in 2011. This was roughly proportionate to the projected economic impact for hosting the Super Bowl in 2014. How does your community become bicycle and pedestrian friendly? These comprehensive measures are developed through a two-step process that uses sound planning analysis to inform effective implementation strategies. Each stage of this process requires the coordination of multiple players and meaningful public participation. Cross County Connection offers a range of services that will guide you through the two-step process and put your community on path to becoming a bicycle and pedestrian friendly, starting today! Educate motorists, bicyclists, and pedestrians on traffic laws and safe practices. Bring awareness to the multitude of health and other quality of life benefits biking and walking provide. Provide opportunities to bring your community together and have fun. Preparation of a Bicycle and/or Pedestrian Master Plan (fee for service). Sitting on Plan Steering Committees – Advising your consultants and ensuring the needs of your community are effectively addressed. 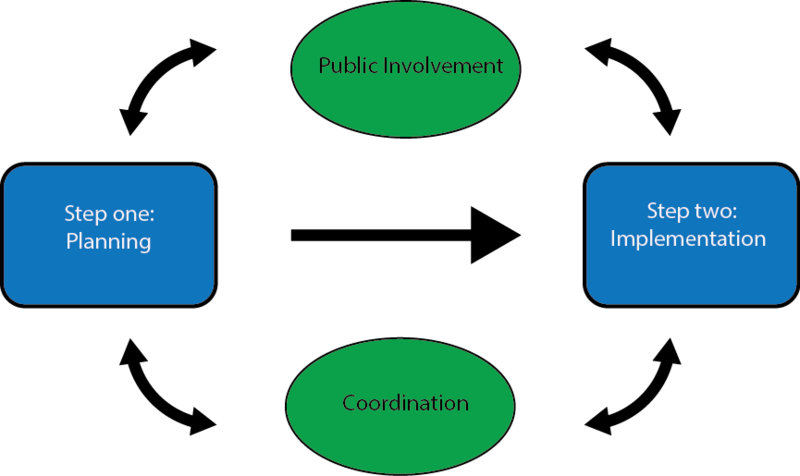 Public involvement should inform both the planning and implementation processes to the greatest extent possible. The public are the ones that will be walking and biking, so they should be the ones that largely determine what a bicycle and pedestrian friendly community looks like. Public involvement also creates a sense of partnership with your community’s residents, avoiding a perception that decisions are being forced upon them. Cross County Connection has extensive experience in assisting communities to connect with residents and solicit valuable input by conducting a wide range of public outreach efforts including: Public meetings and visioning sessions Allow us to lead your public meetings and work with the public to craft a vision for biking and walking in your community. Surveys Cross County Connection has experience in utilizing web-based and in-person surveys that assess your community’s concerns and gauge attitudes towards a range of solutions. Interactive websites Websites are an effective way to reach the broadest range of community members. Cross County Connection has developed websites for bicycle and pedestrian master plans and studies that include web-based maps that allow residents and visitors to share the best places to walk and bike and identify areas of concern. Social media and print based marketing campaigns Get the word out about what you are doing to make your community bicycle and pedestrian friendly. This could include development of a community bike map. These maps are an effective way to provide community residents and visitors with an easy to follow map to plan their journey. Coordination between the relevant parties throughout every stage of the planning and implementation process is crucial. Identifying potentially affected parties early in the process is important. Communication between these parties is important to avoid last minute issues that could derail the process completely. 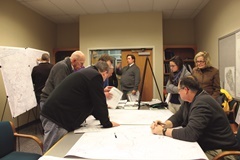 Cross County Connection has a range of contacts in the world of bicycle and pedestrian planning. We are experienced in identifying who needs to be involved and facilitating communication between them. Local, County, Regional and State Agencies Identify potential partnerships and use our contacts to ensure the right people, at every level of the decision making process, are involved in the process. Internal Coordination Facilitate communication between government officials, municipal and county departments, and other interested stakeholders in order to work through issues as they arise. Green Teams Cross County Connection can assist your community’s Green Teams with implementing sustainable jersey action items. Federal Highway Administration (FHWA) – Guidance on Bicycle and Pedestrian Design Flexibility National Association of City Transportation Officials (NACTO) -Urban Bikeway Design Guide AASHTO Guide for the Development of Bicycle Facilities, 4th Edition (2012) – It must be purchased.